The Ministry of Construction is seeking the PM’s approval to hire foreign consultants for Dong Van Stone Plateau’s planning to develop its tourism potential. Dong Van Stone Plateau was recognised as a Global Network of National Geoparks (GGN) member on October 3, 2010. The plateau is Vietnam’s first geological park and only the second such park in Southeast Asia, after Langkawi in Malaysia. 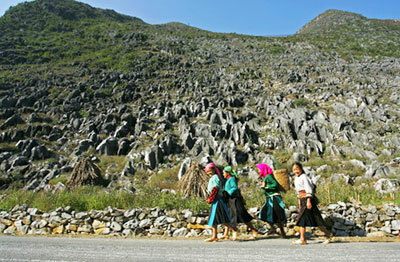 Ha Giang Province has implemented several GGN recommendations. The plateau covering more than 2,350 square kilometres and is renowned for its high biodiversity and ethnic minority cultures. The plateau is 80% limestone and contains the fossils of thousands of species of prehistoric creatures dating back 400-600 million years ago.